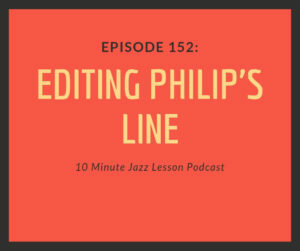 This week we take a peak at a line one of our listeners, Philip, came up with and posted in our 10 Minute Jazz Lesson Community Group on Facebook. I love the fact that Philip is thinking about many of the concepts we talk about on the show and his initiative to start composing his own lines is impressive. There were a few notes I thought could be changed in this line to make it have a little bit more harmonic gravity and I decided to make an episode detailing those thoughts. Hope you enjoy the episode and come out of it with something you can take with you in your own line writing exercises!